In 1896, L. R. Wilberforce, demonstrator in physics at the Cavendish Laboratory, Cambridge, constructed a pendulum that functions simultaneously as a linear oscillator coupled to a torsion pendulum . 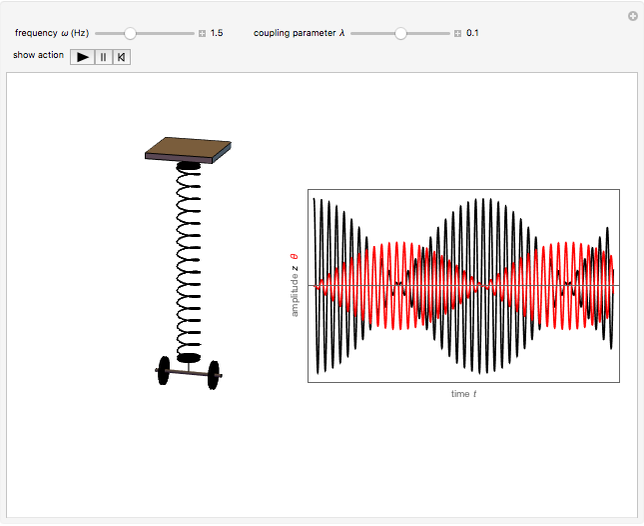 If the frequencies of the translational and rotational modes of oscillation are nearly equal, energy can be transferred from one mode to the other, while each motion exhibits frequency beats depending on the coupling between the two modes [2, 3]. 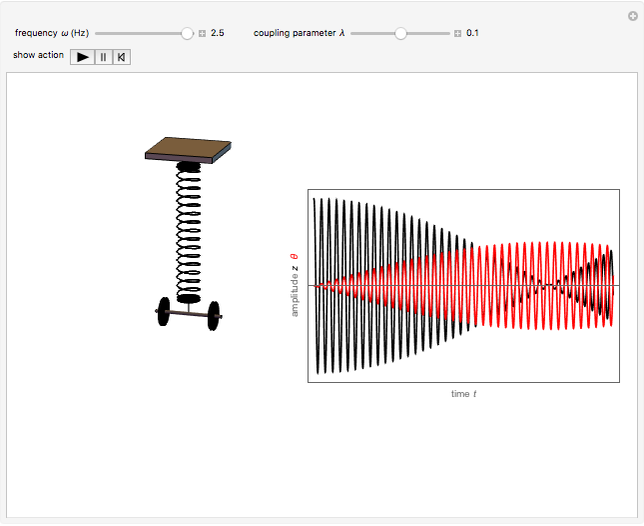 The graphic shows the oscillations of the pendulum for selected values of the frequency and coupling strength . On the right are plots of (in black) and (in red), the amplitudes of the linear and torsional oscillations, respectively. 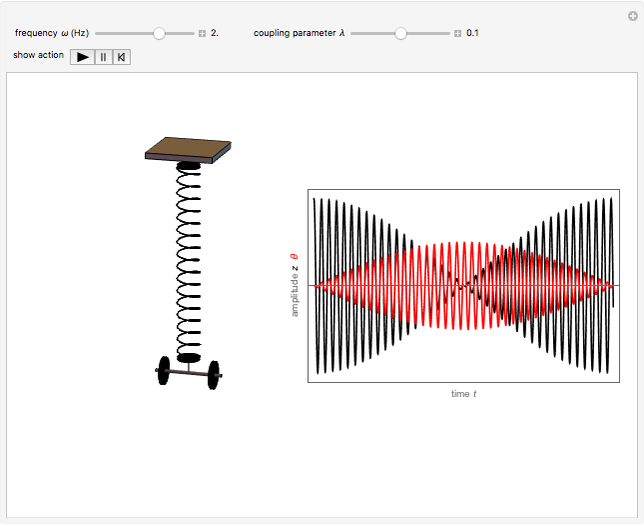 As shown in the plot, the out-of-phase linear and torsional motions exhibit beat oscillations as energy is exchanged back and forth between the two modes. 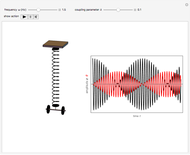 A YouTube video of a Wilberforce pendulum is shown in . We are interested in solutions for which , so that , assuming . L. R. Wilberforce, "XLIV. 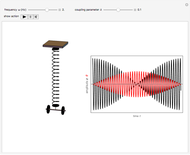 On the Vibrations of a Loaded Spiral Spring," The London, Edinburgh, and Dublin Philosophical Magazine and Journal of Science, 38(233), 1894 pp. 386–392. doi:10.1080/14786449408620648. R. E. Berg and T. S. Marshall, "Wilberforce Pendulum Oscillations and Normal Modes," American Journal of Physics, 59(1), 1991 pp. 32–38. doi:10.1119/1.16702. 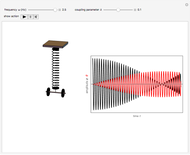 M. Hübner and J. Kröger, "Experimental Verification of the Adiabatic Transfer in Wilberforce Pendulum Normal Modes," American Journal of Physics, 86(11), 2018 pp. 818–824. doi:10.1119/1.5051179. Wilberforce Pendulum [Video]. (Nov 15, 2018) www.youtube.com/watch?v=S42lLTlnfZc. S. M. Blinder "The Wilberforce Pendulum"